Asparagus season is upon us! I noticed the first stalk tops emerge just a week ago and now it’s a lovely counting game as the number of spears increases daily. I planted my first asparagus bed ten years ago, and even though I erred by digging the two trenches too deeply (yes, there are trenches), the plants have been surprisingly forgiving and have been producing reliably ever since. A new bed planted some five years ago has us in asparagus until about June. 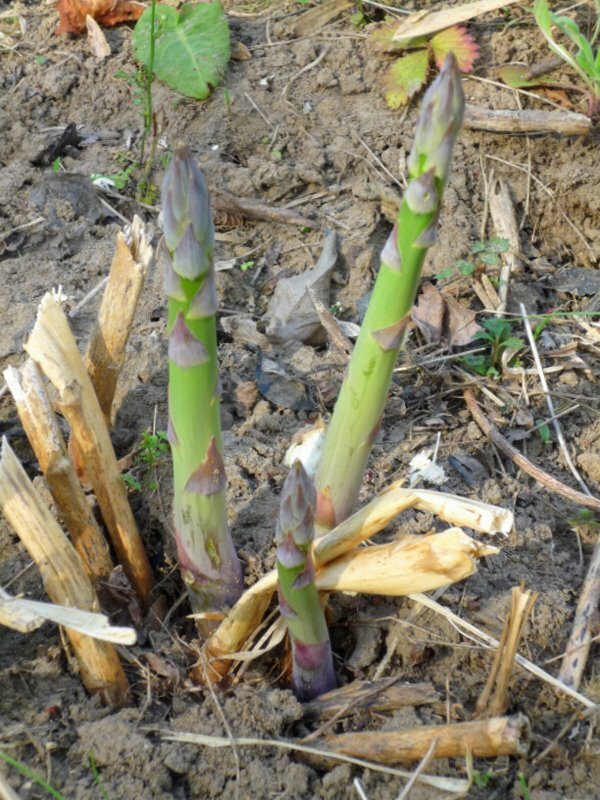 If you’ve not grown this elegant edible before, check out the HGIC website for recommended cultivars, as well as the GIEI site’s vegetable profile for some ingenious ways to extend your own personal asparagus season. Yes, there’s a little delayed gratification, but those three years pass quickly and are well worth the wait! I totally agree! I planted my purple asparagus 4 years ago, and in my usual style, just left them to die – especially after their very poor show in the first couple of years. Spears the first year were eyeliner-thin. I patiently left them alone as instructed. Last year I got to harvest about 3 pencil thin spears that we all relished with a knife and fork slowly like it was our last meal. This year??!! I'm totally shocked to be harvesting these gorgeous and thick, purple spears. Patience is definitely a virtue when it comes to asparagus. The fun thing about purple spears is that when they're done cooking, they turn green. Easy.